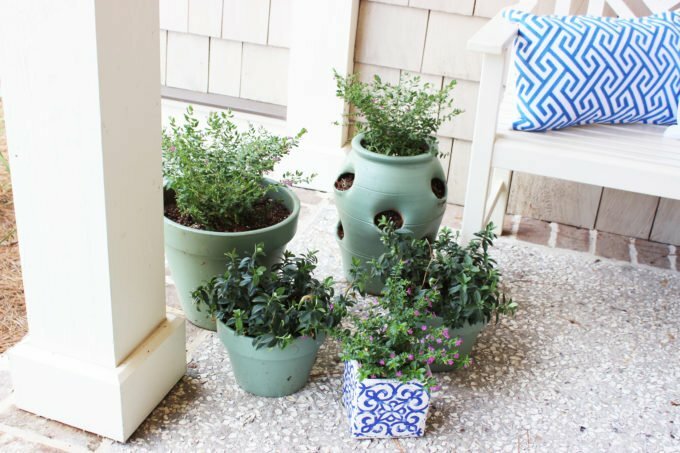 Making your outdoor spaces looking pretty! Even though this is my reveal, it never truly feels done! I must have changed things around about 100 times! But, what I learned from this, is that there are so many different ways you can use the same item. If you have been following during the last 4 weeks one– two–three– four, then you know I’ve been tackling many obstacles– what color pillows, arrangement of plants & furniture, lack of product I needed at the store, and so on. However, I’m excited that it’s finally all done, and I can safely say, I’m thrilled with the result! It feels simple, yet eclectic and colorful. The weather these last few days has been rainy, so many of the photos are a bit bleak due to the cloudiness. …And let’s start with the right side of my porch, where I’ve placed the little metal table I found. If you remember it was once black here. I’m a bit disappointed, because the table is not made for heavier items, so I may eventually have to replace it with something sturdier for my beautiful Tiffany Lamp to sit on top of. 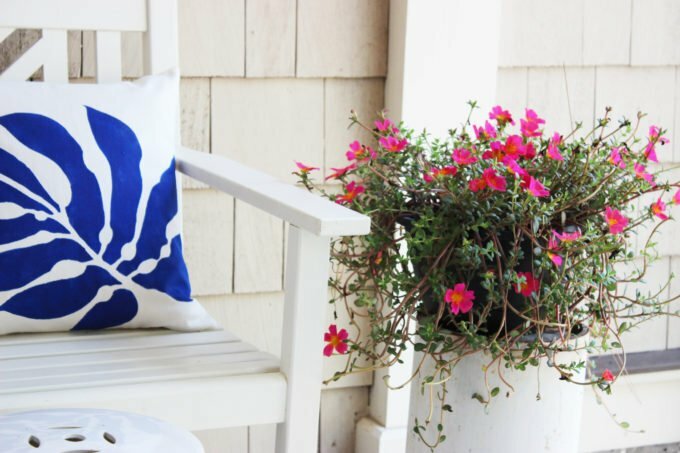 The other side of my bench displays a fun, printed cobalt pillow I made (spoken more about below), alongside some beautiful pink flowers. I must say, I love the unlikely mix of these colors together! …and continuing on to the bigger picture. 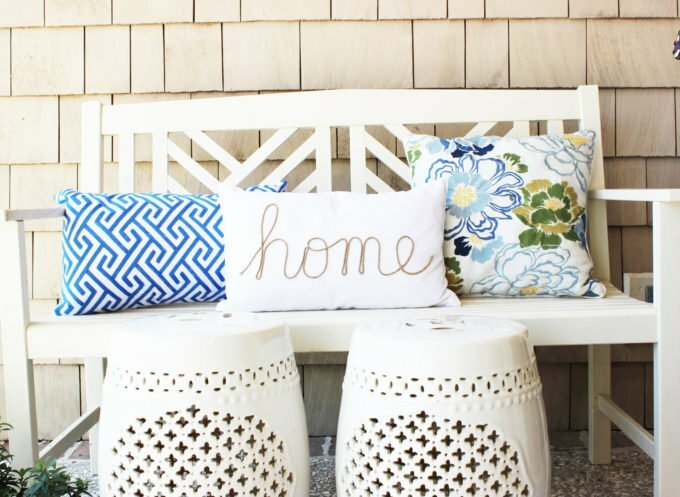 I am a big fan of the Mediterranean vibe from my Tiffany lamp and the cobalt pillow from paint a pillow company, which offers the perfect kit to paint & stencil your very own pillow. This was my first pillow stencil, and I followed the directions to a tee. When I did the removal of the stencil, I was thrilled to see no paint had bled. I am going to post a special tutorial on making the pillow soon. 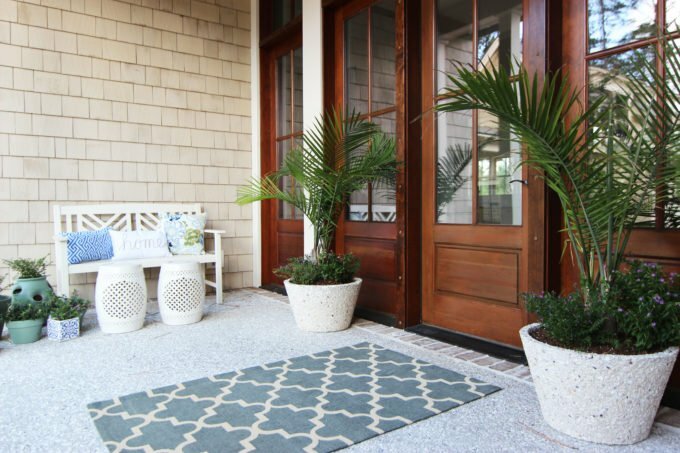 Completing the left side of the entryway, resulted in a whirlwind 2-hour trip to the AtHome store in Charleston. It was well worth the trip. The store was filled with everything I needed. I was not able to find the pillow I originally picked from their website, but I found some pretty, eclectic ones that had the similar colors. I was also able to find a few items for my other garden challenge. So, all and all, it was a successful trip! I’m obsessed with this adorable “home” pillow, appropriate for this challenge. The center garden is now a butterfly’s paradise. We counted over 25 butterflies this week. 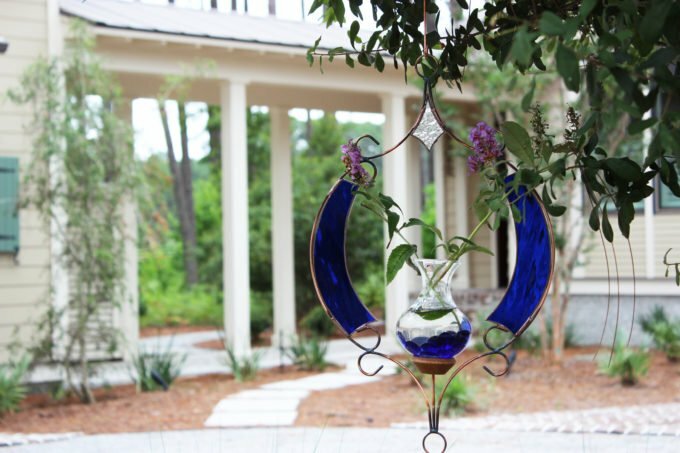 We also found the perfect spot for hanging the water garden. I ended getting a rug from World Market, only because Pottery Barn’s delivery time was not going to work out. Initially, I had the water garden hanging in the entryway, but because of the height of the ceiling, the oak tree was a better place for it. 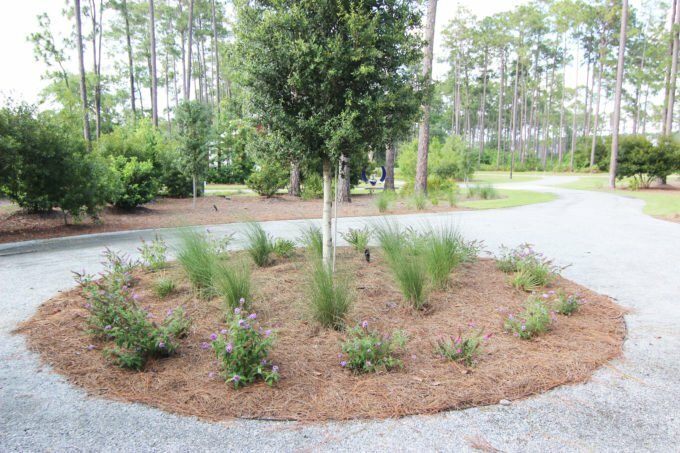 It also added some charm to the circular garden! 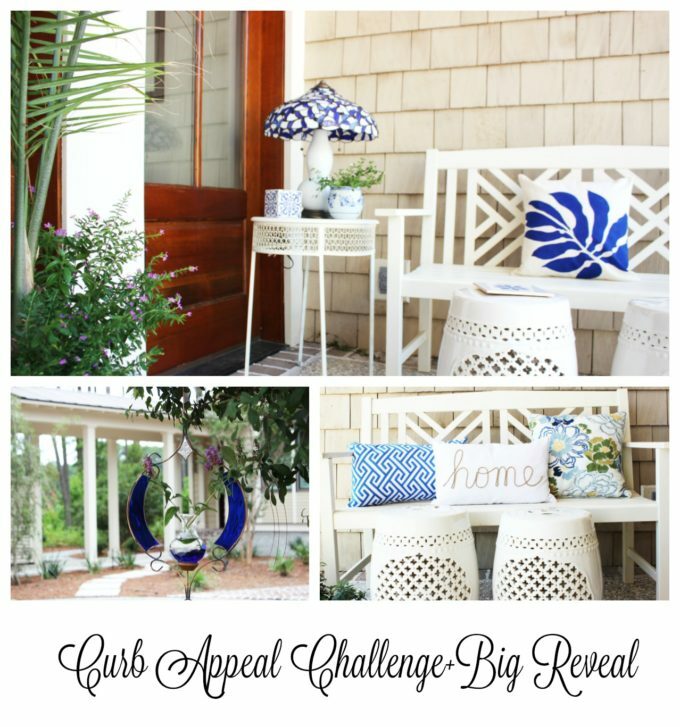 Hurry over to the other wonderful blogs to see their big reveals! Also enter our Giveaway to win $110. your home is amazing. 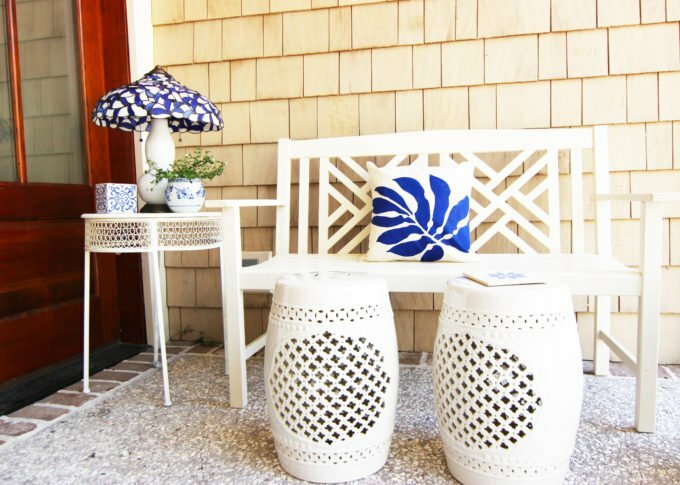 Love the pops of blue on your porch. Hi friend, I love when you stop by its a honor, the blues did end working well, even though I wanted to use another color. Will head over to your blog and return the favor. 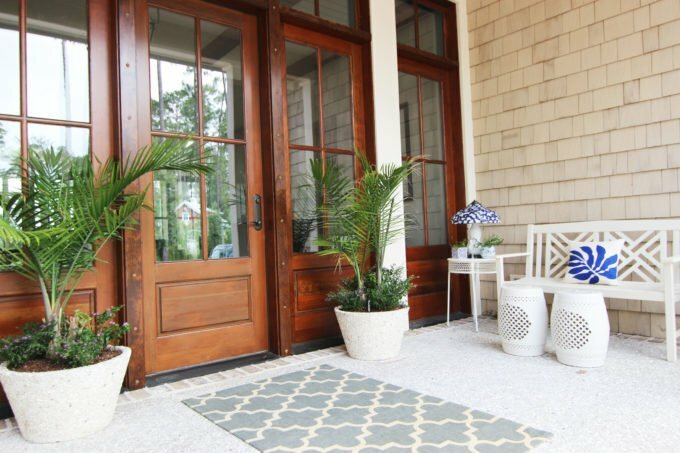 What a perfect porch! I love all the decor choices you used, so light and bright! That lamp is so cute there too. Hey Deb, Thanks so much, you did such a great job organzing this, I hope you are happy, its been crazy huh! will head over to your place soon. So pretty! 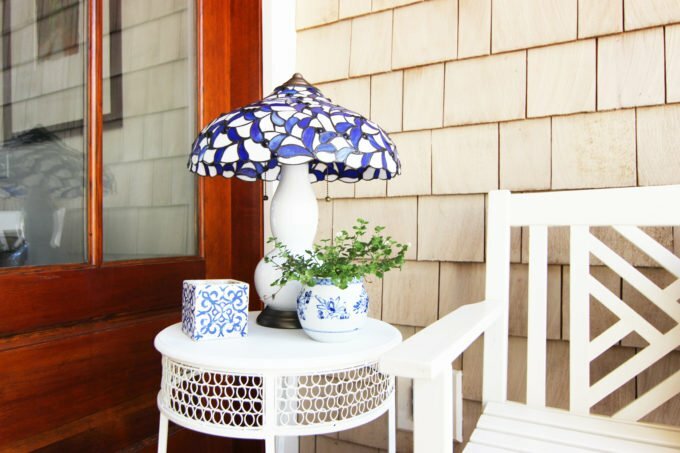 I adore your lamp and garden stools! Simply gorgeous, Maria! Love all the cobalt blue touches! Thanks, I am so happy its done, because I need a break. I loved how it all turbed out. I love the colors you are using! It looks beautiful. Wow! So excited you stopped by. I know we are so busy, but its a great feeling to communicate with each other and respective blogs. A beautiful look Maria. I love the white which makes everything look so pretty and crisp. And the addition of the green is in keeping with nature. You have some amazing landscaping going on there and your butterfly show must be incredible. Hey Mary Thanks! I try to keep up with gardens and everything else around the house. Do what I can, if you know what I mean. How beautiful! I’m loving the pops of cobalt blue, and looking forward to seeing how you did the stencil on the pillow. 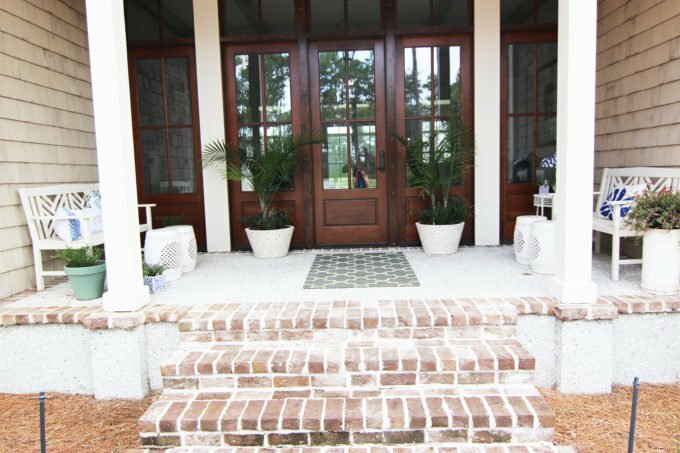 Your porch is stunning, Maria! I love the blue and white against your beautiful wooden doors. I hope you enjoy using the new porch for many years! So beautiful! I love all the white and blue! So Glad you to stop by! Hope you have a fabulous weekend, I still need to get my act with the UTube soon. Love how the blue pops against those doors and I just love the little hanging water garden. So adorable! Hi Kim, Hope you are having a great weekend! I’m pretty happy with the outcome, it was a bit stressful, but you get better everytime you do a challenge. So beautiful Maria!!! Love the pillow you made and all the ones you found :). Your front looks absolutely beautiful and I have a feeling you are going to have lots of happy butterflies in your future!!! Thanks so much Tara, Hope you have a great holiday weekend! Love the white & blue so pretty. Thanks for linking up to Merry Monday! Sharing on G+! Have a great week! Kim, love the party and have your self happy 4th. I’m sure the butterflies are LOVING their new home. It’s gorgeous! Happy Fourth to you! Happy forth to you, Areyou going to the Haven, hoping to see some of you gals there, its my first.